Very strong winds will affect most of England this week with a new yellow weather warning issued by the Met Office today. The warning has been issued for between 9pm and Wednesday January 17 and 1pm on Thursday January 18. The strongest winds are expected to transfer eastwards across the warning area before clearing by early afternoon. 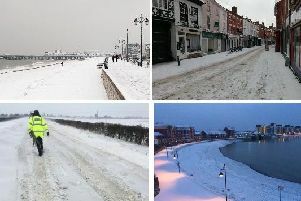 Road, rail and ferry services may be affected, with longer journey times and cancellations. There is also a possibility that some bridges may close. Power cuts may occur, with the potential to affect other services, such as mobile phone coverage. Injuries and danger to life from flying debris are possible, along with some damage to buildings. In addition, large waves are expected to affect some western coasts with beach material being thrown onto sea fronts, coastal roads and properties. There is the potential for gusts of 60-70 mph quite widely and a small chance of winds reaching 80 mph in places. The location of the most damaging winds is currently uncertain, although parts of northern and eastern England currently look more at risk. Along with the strong winds a spell of heavy rain can also be expected.